By // candlecharts.comA chart is like a map, the more information each one provides, the better the chance of reaching your destination safely. Candle charts display a more detailed and accurate map of the market than do bar charts.A Japanese book that I had translated stated, “It is not an exaggeration to say that candlesticks are the best in the world and a very exquisite creation for charts.”l This is because, as detailed below, candle charts open new avenues of analysis and offer many advantages over bar charts:Candle charts will pictorially display the supply-demand situation by showing who is winning the battle between the bulls and the bears. Bar charts do not. *Like bar charts, candle charts will show the trend of the market, but candle charts add another *dimension of analysis by revealing the force behind the move. *Bar chart techniques can often take weeks to transmit a reversal signal.However, candle charts will often send out clues of imminent reversals in one to three sessions. 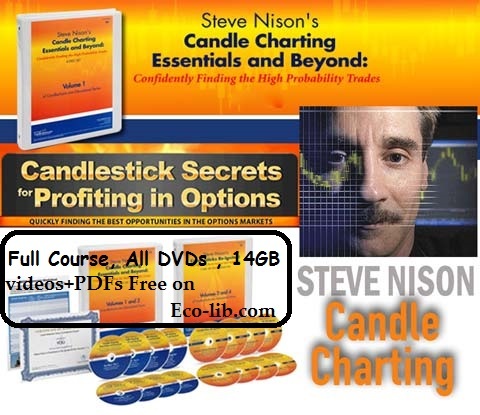 The result is that candle charts often provide the opportunity for more timely trades. These are just some reasons why the flames of interest in candle charts grow ever brighter. In just a few years, candle charts have joined bar charts and point and figure charts as a basic charting technique. Candle charts are drawn using the same data as bar charts (the open, high, low, and close), so they send all the same signals that can be found on charts. Yet, as just discussed, the candles offer many advantages over bar charts, so using candle charts instead of bar charts is a win-win situation. When you use bar charts you only get bar chart signals. But, with candle charts you get all the bar chart signals, plus you gain the unique and powerful insights provided by the candles. so, why use a bar chart? Because the Japanese are major players in most of the world’s markets, there is strong interest in how the Japanese use their technicals to trade. Candles are the most popular form of technical analysis in japan. The importance of the candles for the Japanese trading community is illustrated in the following quote from the European magazine, Euroweek.This article quotes an English trader who works at a states: “All the Japanese bank. He traders here-and that’s in the foreign exchange, futures and equities markets-use the candles. It might be difficult to work out the billions of dollars traded in London on interpretations of these charts each day, but the number would be significant.” Think about it: Although billions are traded every day based on the candle chart signals, until recently we had no knowledge of how the Japanese viewed the market with their technicals. This is hard to believe. Knowing the candles and their other technical tools discussed in this book may help answer the question, “What are the Japanese going to do next?